Swimming to Africa…how cool is that? The Sandycove Island Challenge, 18 Sep 2010, brought me back to swimming (almost 20 years had gone by where I just didn’t swim). 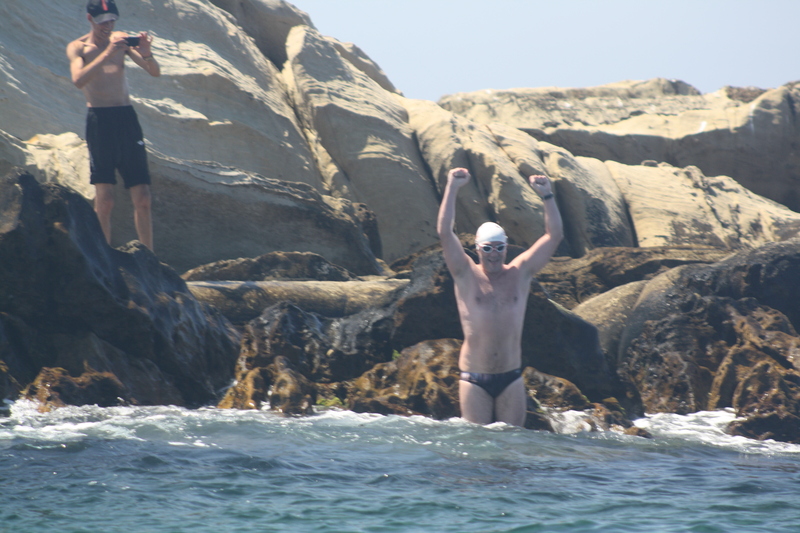 I still remember my first training session towards the Sandycove swim. My plan was to do a 750 meter pool swim. 400m in and I was dying a death. Arms and chest burning with pain. I wasn’t too happy leaving the pool that day. Did a couple more swims managing to get up to 1500m before the big day. I swam in a wet suit and my hat number was 304 (it became one of my most prized possessions). For the next two years I tipped away doing two swims a week (4 – 6k max for the week). It was mainly pool time but every now and again I’d meet up with the Rodgers brothers (Ken and Alan) to swim in Inniscarra or the odd lap of Sandycove. During the summer of 2012 I did Ned’s Cork distance camp and that was it – I wanted to be a marathon swimmer. I missed the last two days of the camp (TBBC [also called the torture swim] and 6hrs swim) so as of yet, my longest swim up to this point was 10k in a wet suit. In September 2012 I attempted the Cork to Cobh 16K swim in togs and finished the swim probably suffering with hypothermia without realising it (severe shakes and had to be dressed by my wife and mother). The last two kilometres were absolute hell. The cold, the mental torture, the thoughts of failing, forcing myself to put my face back in the water and try and carry on. Don’t know how I made it but I did (4h 0m 55s). I didn’t swim again for another two months. Prior to Cork to Cobh Ken Rogers had talked about Lake Zurich but none of us committed to it. Three weeks later I got a mail from Ken saying entries were open. My head still wasn’t right. I applied 3 weeks later but unfortunately it wasn’t to be, mid December I got mail saying I wasn’t selected. I was gutted, took a few days to get over it. Ken didn’t make it either but Alan Rogers did. In Jan 2013 I joined Source with the intention of meeting Alan on a regular basis and train with him while he prepared for Zurich. Ned invited him to a Saturday morning session and I went along. I managed to complete the 12k session with Ned driving the lane. That evening I got a mail from Ned and every time I think about it, it brings a smile to my face. 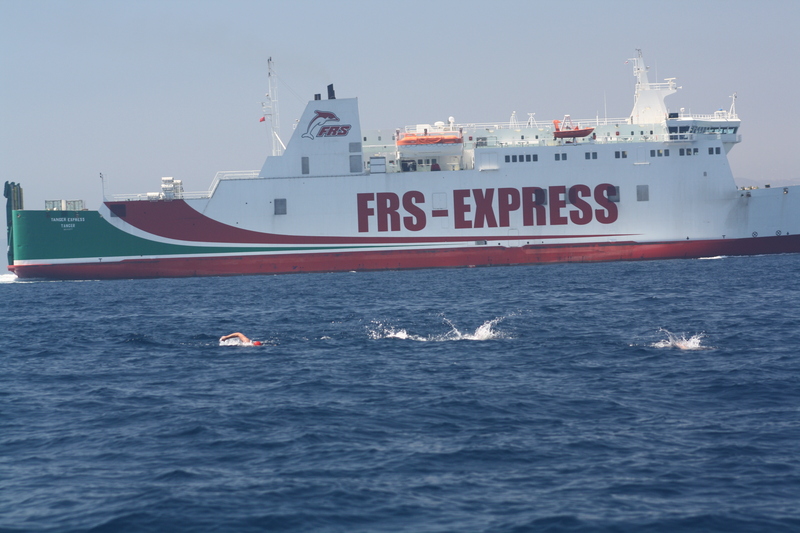 It was an invitation to swim Gibraltar with himself and Eddie Irwin with 3 “IFs” attached (faster, fitter and further). What an opportunity. My response was an immediate yes and my first thought was I’m going to wear Hat number 304 from Sandycove Island Challenge 2010. I’m going to swim the Straits with the Hat that brought me back to swimming. When the excitement died down the fear kicked in – how am I going to keep up with Eddie and Ned? I told everyone I met over the next few weeks. This is a bit of reverse psychology for myself – tell everyone so I can’t back out and more importantly I can’t let myself fail. Training increased from 4 – 6k to 25 – 30k in the space of 3 weeks. Working shift had its pros and cons. Con – 4 days to get 25 – 30k done (the 1st of which I was finishing up work at 07:30hrs that morning). Pro – could go to the pool at 10am in the morning and have it all to myself. The other pro here was Eilís spotted me and wondered what I was up to. She threw some training sessions my way and within a month I could ‘feel’ the water again. Nothing I could say would do justice to the difference she has made to some people’s swimming achievements, I don’t know how she did it but I felt connected again. Cork Distance week 2013, due to work commitments, I was going to miss the 6hrs swim again but I signed up (and paid €50 extra for the opportunity to be tortured) for the TBBC. Turned out to be 4 hours and 15 minutes of head wrecking crap from Ned (2.5 hrs of swimming around a moving boat in wide circles, I absolutely hate swimming in circles) but it was my longest swim to date. Only downside was, I was still a 4hr swimmer. In my head all marathon swimmers are 6hrs+. Myrtleville became my swimming home in lead up to Gibraltar (all thanks to Bernard Lynch and Carol Cashell). Water temperatures had jumped to 18 -19C so no complaints. 5 days before I travelled to Gibraltar I got a phone call while at work (at 10:15pm) from my wife. Passport had expired 11 days earlier. I prefer not to think back on events for the following 2 days but Nicola sorted everything. New passport would be available 20hrs before boarding plane. All thanks to Nic, my head was still in a good place. Before I knew it, I was on the plane with the thoughts of possibly the four of us swimming the next day (Liam Maher joined the party having only made the decision just a week before we travelled, fresh from his 28.5 mile swim around Manhattan Island – what a man!). The plan was, as soon as we landed we would head straight to Tarifa and make contact with Rafael (organizer of ACNEG, the Strait of Gibraltar Swimming Association) and ask to swim the next day. Plan worked, Eddie and Ned had their homework done, we would be swimming to Africa the next day. I managed to get very little sleep that night but it didn’t matter. I was living the dream…from 750m to Swimming to Africa – how cool is that? Driving down to Tarifa the next morning we could see Africa across the Straits. What a buzz – it was actually going to happen. Within 30 seconds of sending a Tweet we hit a wall of fog. Elation to trepidation. We spent the next 3hrs hanging around, nerves building, not knowing if we would get the go ahead. Finally Rafael tells us we have to be ready in 10 minutes. This is it. No more nerves, it’s all excitement now. Boat drops us to starting point. 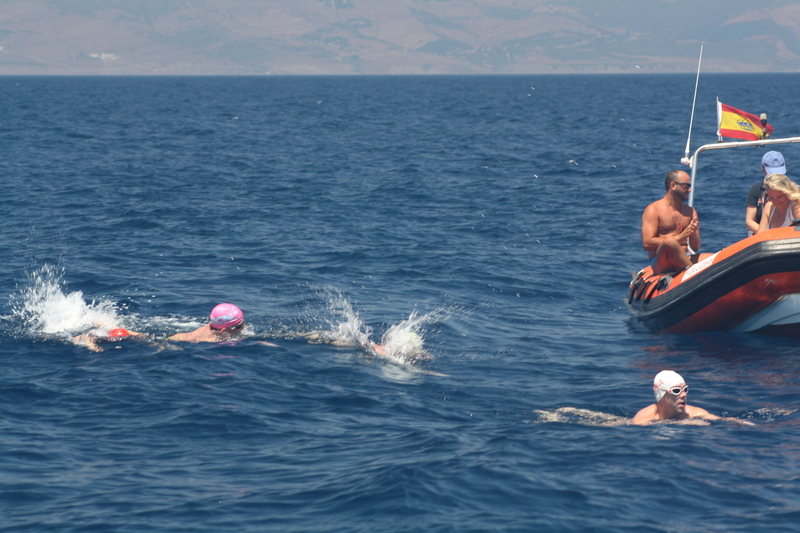 We get in about 15 meters from shore and have to swim back and touch the rock before we can start. Immediately the strength of the current hits me, this is going to be tough. I don’t care, I’m going to swim to Africa with three legends of open water swimming from Cork. Chest is pounding but I’m on a high. We all touch the rock together. There’s a 15 second wait that felt like forever and we were off. The 1st thing that hits me is the drop off (the ledge 10 feet below suddenly ends in a shear drop – to nothing), wasn’t expecting it. Feels like I’m going to fall into it so I close my eyes, take a few stokes and it’s gone. It’s now wide open sea and all I can think of now is pilot whales and dolphins. Starting to get anxious, have to tell myself cop on and enjoy the swim. I pop my head up to see if there is land ahead. Mind games to try and calm myself down. It takes about 5 minutes before I relax into my stroke and allow myself to have one of the best swims of my life. I pair up with Ned while Eddie and Liam swim together. After half an hour I’m out front by myself loving every second. I’m literally like a six year old at Christmas jumping for joy inside. Every now again Ned drifts up and swims alongside me. I’m beaming with the biggest grin ever and give him the thumbs up. He obviously doesn’t see me but I don’t care. We didn’t feed until the first hour and we managed 4K. Good pace and felt great. The plan is to feed every 30 minutes from here onwards. Catherine Fravalo (Ned’s partner) is on the crew boat and manages the feeds for all four of us. Even though there were 3 friends in the water with me it was a big comfort having a friendly face on the crew boat. She got it right every time. The next 30 minutes fly by and during this feed we get a good glimpse of the Moroccan coast. There are plenty of tankers around us now and the whole scenario seems surreal. Pilot boat tells us that we are now 7k into swim. At the 2 hour feed, I think about the Irish speed record held by local swimmer Diarmuid Herlihy for the past 5 years for the first time. It’s on, just need to maintain pace, not a problem, feeling great. All those hours in the pool and Myrtleville are paying off. It’s always the way, the really good swims seem to require less effort. Throughout the swim the focus is on stroke and the happy thoughts are of my family. Every now and again the mind drifts to what else is in the water but it doesn’t last long, just blank it out and concentrate on stroke. At the 3 hour mark (3hrs 1min to be precise), I had a brief conversation with Ned who says the three of them agreed that if the record was on I should blast ahead and go for it. Plan is to go flat out for last 2k. The tough part of the straits is the last 4k. This is where the current is at its strongest. The boat is holding me back to stay in a group but Catherine manages to persuade the pilot boat to let the group split to better the chances of breaking the Irish record. Without Catherine, we wouldn’t have had the successful outcome that we managed to achieve. All out sprint into the finish. I lead out, Ned is on my toes. I’m good with this. I’m on a complete high so my head is strong. I look back 5 minutes later and he is still there. I then push it that little bit harder for approximately 3-4 minutes and when I look back again, he’s gone. Just me and the lead boat and land is now so very near. Pace is still very fast. I clear my head, no bad thoughts, block everything out, just conscious of heart rate and the focus is staying calm inside. All of sudden I feel like vomiting, head crashes, Cork to Cobh comes flooding back. I just want to stop. I look at my watch and time is 3 hours 26minutes. Can’t stop. I start shouting at myself. Don’t lose it now or the body will give up. I look up for the boat it’s gone. Panic, the boat drifted right so we would make a point to point finish from Faro de Tarifa to Point Cires, I’m cursing them now, I look at the beach and I look over at them, the two pilots are shouting and waving for me to follow them. Face down in the water for one last push. I can see the rocks getting closer and closer underneath. Then I touch and immediately check my watch. 3 hours 31 minutes, beat the record by 7 minutes. I drag myself up on the rocks and punch the air. I’m on top of the world.